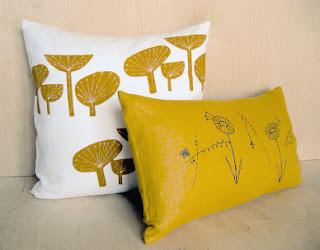 so, yesterday , my friend Alessandra and I were talking about finding so many designers out there that are stealing our ideas...not literally, but feeling like as soon as we get a certain idea, we find someone else doing it. like a strange de ja' vu or iconic vision. are there so many of us on the same page? as a painter i was always looking at mentor artists for ideas but was always able to come up with my own ideas that could be associated with other artists, but never felt like i was copying what i saw. but this new art of craft has this face so familiar that we all see the same thing? not really sure how to put what i'm thinking...but we all do sketches...we look and see and find tons of work we love....certain subjects, especially birds are big now....i absolutly love them..hence my new bird line. but making new images without feeling like i'm copying is getting quite tough in this field. 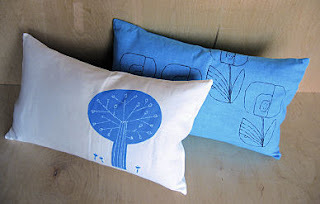 anyway, here are some great pillow by threesheets that were posted on design*sponge, by another jenny....i really love these even though they remind me , perhaps too much like Lucienne Day as well as many of my doodles in my sketchbook. 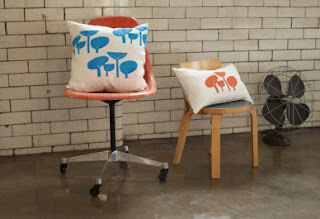 You can check out more about Lucienne Day here.